Following cataract surgery, many patients describe the recovery as quick and virtually painless. At Southwest Eyecare & Laser, in Bakersfield, CA, we use advanced technology to provide you with an efficient procedure that has fewer risks and complications than traditional cataract treatment due to improved precision and minimized alterations to your eye. Dr. Gregory A. Stainer is an experienced ocular surgeon who will provide you with the highest quality medical care. Our team will extend that level of care throughout your entire cataract surgery recovery. The cataract surgery recovery process is generally seamless as we take every measure possible to minimize the risks associated with your procedure. We conduct an in-depth evaluation of your ocular health to recommend the correct intraocular lens (IOL) and perform precise laser-assisted treatment. Our efforts, combined with the typically safe nature of this surgery, allow patients to resume their normal activities fairly quickly. As with any other procedure, recovery progresses in several stages. Laser cataract surgery does, however, have a quicker recovery time than the traditional treatment. Some patients even notice vision improvement as early as several hours after the procedure. However, as each patient heals differently, it may take a few weeks for your results to become noticeable. After your procedure, we will conduct a post-operative observation. We will apply a protective covering that you will need to wear as instructed to prevent infection and damage to your eye. It is important that you arrange for a ride to and from your appointment. 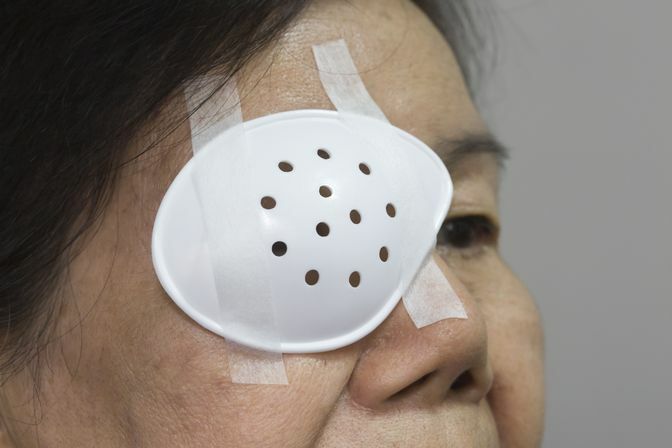 For most patients, the cataract surgery recovery process is generally seamless, as we take every measure possible to minimize the risks associated with your procedure. We conduct an in-depth evaluation of your ocular health to recommend the correct IOL, and perform precise laser-assisted treatment. Once home, we ask that you do not read, watch TV, or engage in any strenuous activity. Relaxing your eye is crucial to your recovery as increased pressure in the eye can cause damage. Any slight discomfort you may experience can usually be sufficiently addressed with an over-the-counter pain medication. The vision recovery process is different for each patient. Eyesight will be blurry because your eye is adjusting, but should improve over the course of a few days. Within the first week after your procedure, any mild sensitivity, residual halos, or gritty sensation should start to decrease. However, it is still important to keep your eye covered at all times to prevent any complications. During the weeks following your surgery, your vision should improve each day as you adjust to your IOL. Any discomfort will also continue to subside. At this time, we will be able to evaluate your vision and give a final eyeglass prescription as needed. You should notify our office if, at any point during recovery, you experience any complications, including vision loss, persistent pain that does not respond to over-the-counter medication, increased redness, light flashes, or multiple new spots (floaters) in your vision. Dr. Stainer will provide you with complete instructions so that you can properly care for your eye. Cataracts can severely limit your ability to function normally. Laser cataract surgery is a lasting solution that provides significant benefits to your health and lifestyle. We are committed to providing you with outstanding ocular surgical care so that you can alleviate blurry vision quickly and safely. If you are considering this procedure, contact us online or call us at (661) 833-4040 to speak with a member of our knowledgeable staff.